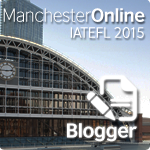 In August 2011, I was lucky enough to get one of two International House John Haycraft classroom exploration scholarships for IATEFL Glasgow 2012. As part of the scholarship, I needed to do some action research and present it at the conference. I chose to research ways to encourage students to use the Internet and other technology resources to improve their English. It was originally recorded using mybrainshark, which unfortunately no longer exists. Apologies for the buzz of the fan on the first two slides – this goes away later. There’s a slide at the end of the recording added just before my presentation, so don’t stop after the thanks! 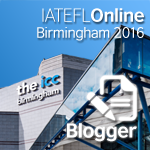 It was originally presented on 21st March 2012 at IATEFL Glasgow. I chose to focus on student use of online resources after using Edmodo, a closed social network similar to facebook but specifically designed for education, for over a year with all of my classes. I observed that only some of the students engaged with the materials and tools I posted on the network and I wondered what I could do to improve their take-up of the resources. As part of my research I did made observations related to two of my classes, did questionnaires with the students in those groups and created a survey which I publicised via Twitter for students around the world to complete, with a total of 74 responses. Everything which appears in quotation marks below is taken word for word from the surveys I did. If you would like to see the original data, please let me know. motivated; they will use anything available to them to improve their English. competitive; they want their English to be better than that of others or than their own is now. connected; they already have easy access to the internet, normally via smart phones or tablet computers. knowledgable about English resources; either their teacher has already introduced them to useful sites or they have been motivated enough to go out and find the sites for themselves. What do students already use computers for? English only appeared as a medium for chatting on facebook and Skype. Therefore computers are only used to socialise in English rather than to explicitly study, or at least studying in English was not important enough to be mentioned as an answer to this question. In my view, the main reason for this is that students are not aware of the range of materials which are available to help them with their English. I believe it is one of our responsibilities to show them these resources, so that students can decide whether they want to use them or not. 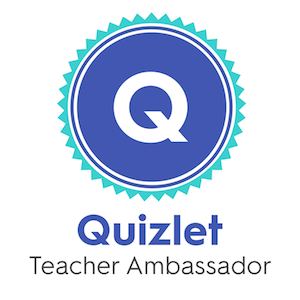 Quizlet is a website enabling you to easily make and find flashcards covering a wide range of subjects. There are currently over 10 million sets on the site, and this is growing all the time. 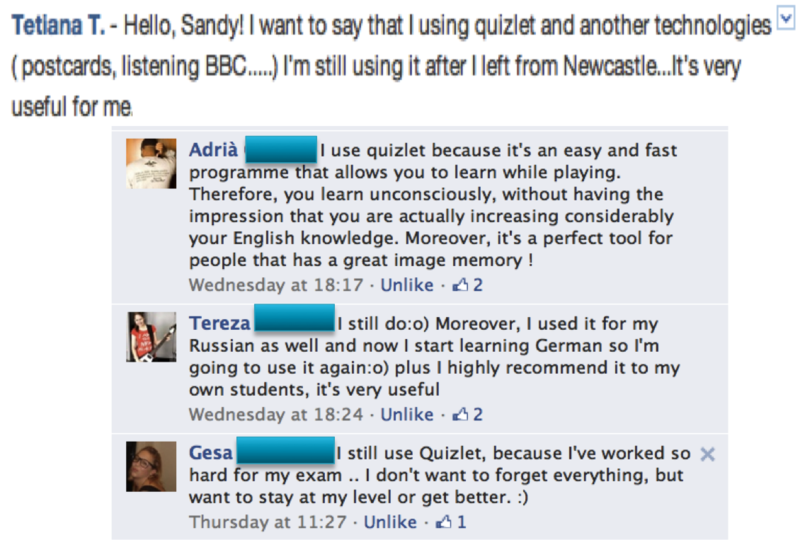 For students, the many different functions of Quizlet give them a lot of exposure to the language in a variety of different forms, including being able to listen to computer-generated American pronunciation (this is about 90% correct by my reckoning, with some problems with stress placement). Games allow them to learn the words in a more motivating, fun way than traditional vocabulary lists. There is a speller function, meaning they can practise a side of vocabulary which is not often explicitly studied and track their progress. 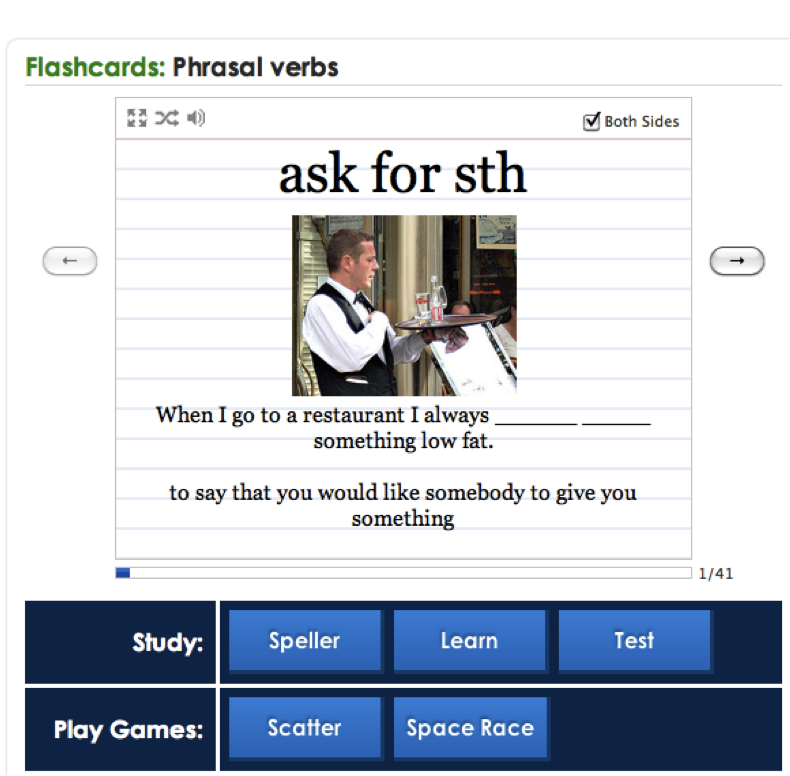 For students who prefer to use paper, the vocabulary can easily be printed in a variety of forms, including as a list or as two different sizes of flashcards, so they still have access to the same vocabulary as those using the computer-based activities. If they are logged in, students can see their progress through game scores/times and tracking of words studied in the learn and speller mode, as well as by completing the test function. The site caters to different learning styles, with some activities based on visual cues, others on audio cues, and still others on moving information around on the screen. It is very easy to personalise the vocabulary students are studying on the site, and they can make as many of their own sets as they please. There is a competitive element, with the highest scores for the space race, the fastest times for the scatter game and the names of students who have completed the learn mode appearing on the set page. Students are encouraged to beat their own highest scores and fastest times. 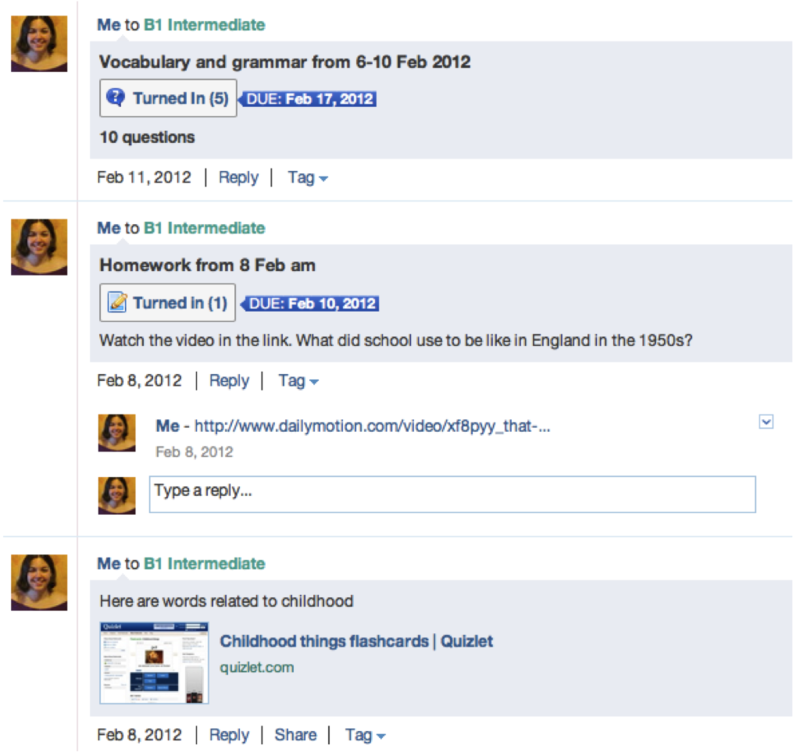 Students can connect through facebook and see what sets their friends have been using, adding a social element. Peer reviews are generally more successful then teacher endorsements, since we are always telling our students what to do! Finally, there are many mobile apps which can be used to see the flashcards on the move, although none of these incorporate games as far as I know. Overall, the variety of activities available to students on Quizlet could sometimes be more fun and more challenging than facebook, although you will probably have to sell it to the students! Quizlet allows students to access everything on the site without requiring a login, although they do need one if they want to track their progress or appear on any high score boards. Other sites which don’t need a login are Lyrics Training and English Central. 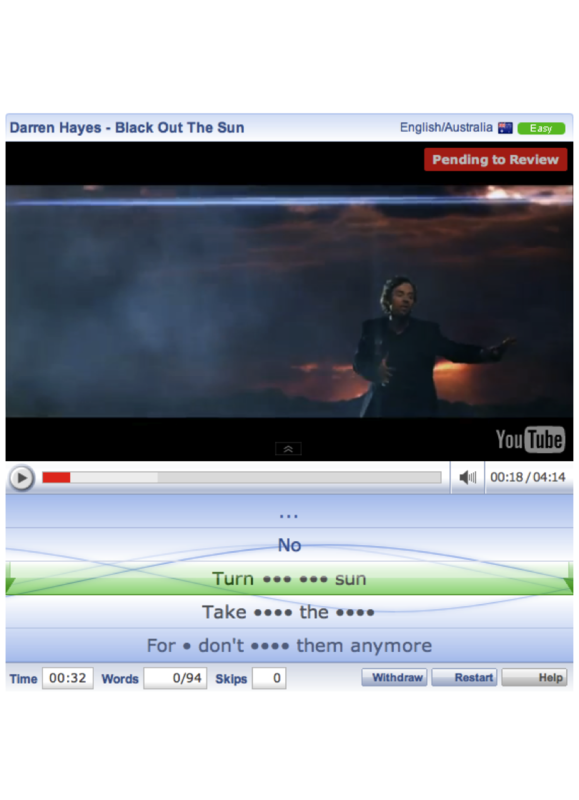 Lyrics Training gets students to watch YouTube music videos and complete the lyrics. There are three levels available: beginner, with only a few words removed; intermediate, with about half of the words gone; and advanced, with all of the words missing. The site is fun, and because students can chose the videos they watch, it (hopefully!) 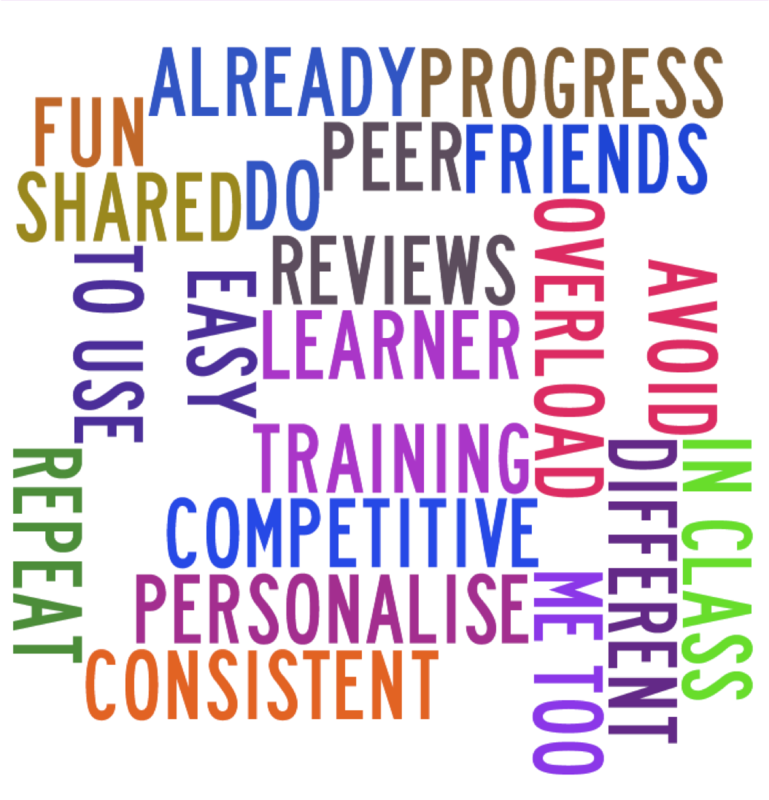 caters to their choice in music and allows them to personalise their learning experience. It is relevant, since many students enjoy learning to help them understand more music. It also adapts something which they may well already do into a more productive task, something which may encourage students to use it without too much hesitation. Students who choose to create a username can make their own video tasks, as in the one I made above, although this is quite complicated. English Central is another video-based site. In this case, learners watch videos and read the subtitles, then record themselves saying the dialogue from the video. The system then analyses their pronunciation and compares it to the original version. They can click on any word to see a definition and example sentence and hear the pronunciation. In addition to being fun and personal in the same way as Lyrics Training, English Central has the added benefit of allowing students to practise their pronunciation in a (fairly) natural way without needing a teacher, something which can be hard to do. Although users don’t need to log in, if they do, the site has a progress bar which allows them to see how much they have done as they move through the levels. 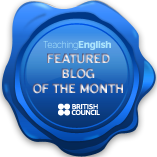 I have written a step-by-step guide introducing students to English Central on my Independent English blog. Another solution to the problem of students reluctant to create another user name is to create a generic class login which everyone in the class can use. While this advice applies to any task we give our students, it is particularly true of students preparing for an exam, often with a limited time available to them. 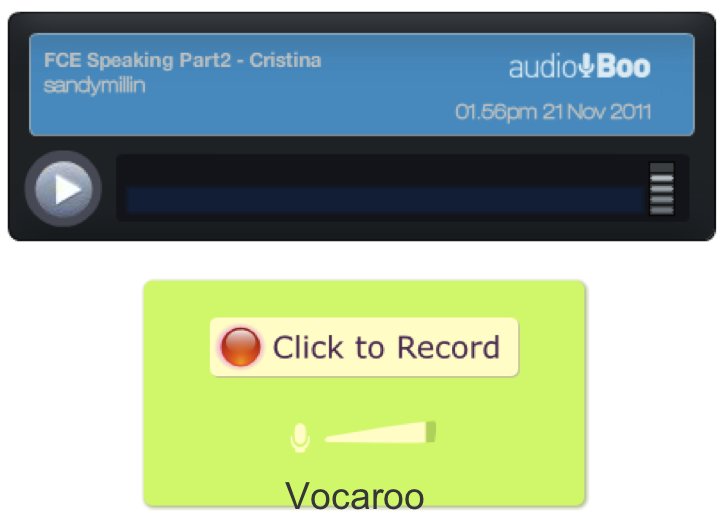 To this end, I encouraged students preparing for the Cambridge FCE exam to take advantage of voice recorders on their phones and on the Internet, such as audioBoo and Vocaroo. As part of the FCE exam, candidates have one minute to compare and contrast two photos and answer a short question about them. This is ideal as a recorded task as it promotes self-reflection (How could I improve? What did I do well?) and also makes students really think about what they are saying (knowing that they are being recorded makes students more careful). Out of 11 students only 2 recorded themselves regularly, but by the week before the speaking exam every student had sent me a recording of either the task described above or the collaborative task, which involves discussing a variety of pictures and solving a problem in pairs. 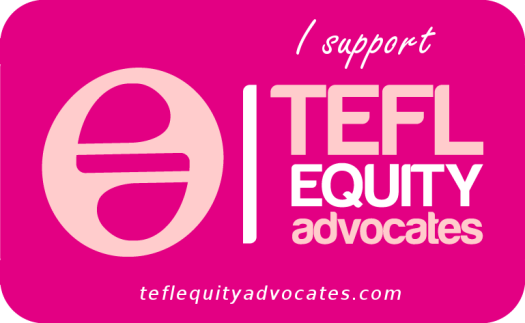 I highlighted the fact that some students recorded themselves and encouraged them to talk about it in class, attempting to promote a culture of ‘me too’ – students wanting to be recognised in the same way – while avoiding having a teacher’s pet. 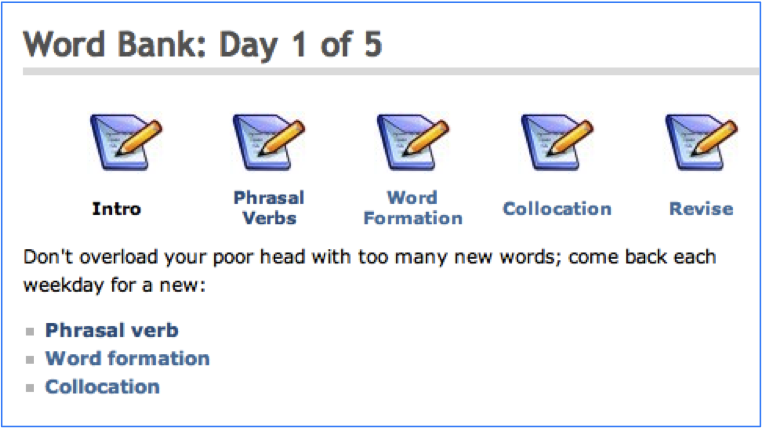 With the same FCE class described above, I introduced the flo-joe word bank as a 20-minute introduction to every class. Every day, the website posts one question each based on phrasal verbs, word formation and collocations to help the students prepare for the Use of English exam. I was lucky enough to have an interactive whiteboard, but it would be easy enough to print the pages or even write the questions on the board as they are quite short. By making students aware that this resource exists and that you value it enough to dedicate class time to it, they are more likely to visit the site themselves and find out what else is there. In fact, this was the case with one of my students, who started to complete the weekly writing tasks posted on the site under his own steam. An alternative for students who want to access extra resources but don’t want to use the computer is to give them ideas based on non-computer sources. Voice recording via mobile phones is one example. 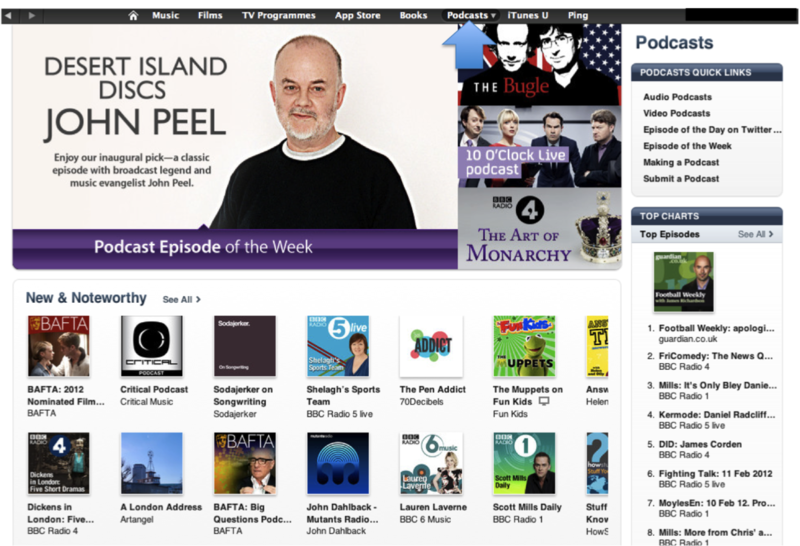 Another is podcasts, which are now easily available and cover (almost!) every possible topic. Students can choose topics and styles of presentation which suit them, and podcasts easily fit into their lives, since the majority of students now have an mp3 player of some kind. Here is a step-by-step guide introducing students to podcasts and showing them how to use them. On being greeted by a sea of English on most of the websites mentioned already, students may feel put off by the amount of language they ‘need’ to access the materials. As teachers then, it is important for us to give them the tools they need to make full use of the resources available. An online dictionary helps them to understand new vocabulary, while (normally) providing the pronunciation of words, key collocations, notes about how to use the lexis and additional reading practice. This is much richer than a simple translation, which while useful at times, should not be the students first recourse in my opinion. 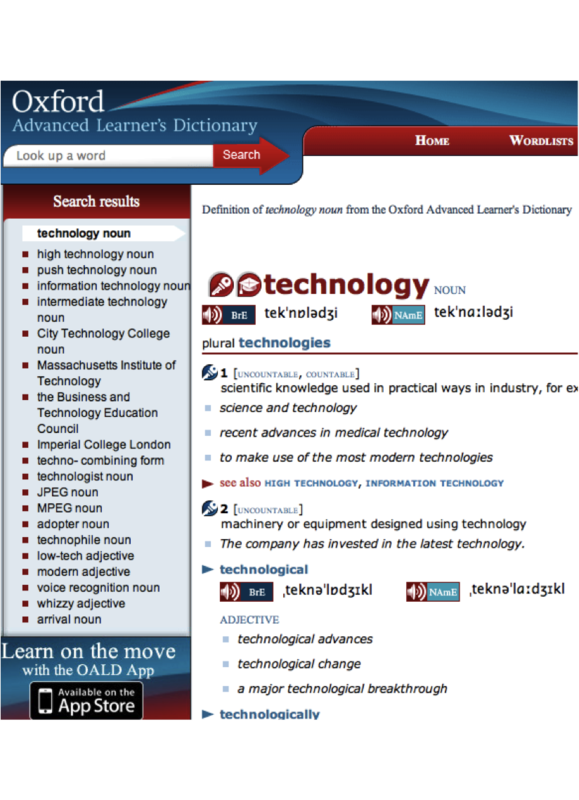 Any student with internet access on their mobile phones can get a variety of dictionaries at the touch of a button. In addition, I encourage my students to use these dictionaries in class, allowing me to help them find their way around at first. By consistently helping students to find meanings themselves, they are more prepared for life outside the classroom when a teacher won’t always be around to help them. Here is my step-by-step guide to online dictionaries. Everyone else understands but I don’t. For students who are not comfortable with technology/computers or who feel their English level is too low, accessing online materials can be quite daunting. If possible, one-to-one attention allows the teacher to focus on a student’s problems, which as well as making the student feel valued, helps the teacher the next time they introduce a tool by highlighting possible problem areas for new users. If it is not possible for the teacher to do this, or if their peers are already confident with a tool, students could be paired up with a ‘buddy’ who can help them. It is also important for teachers to ‘share the love’ when it comes to new technology: by showing other willing teachers how to use the tools you are introducing, you give the students more possible helpers. If your school has a self access centre, you could also demonstrate the tools to those who work in it, so that students can ask for help and get extra support there too. Avoid showing them too much, too fast: introduce tools one a time, and when students are comfortable add another one if necessary. Once is never enough: just because students have seen a tool once, it doesn’t mean they can use it again. It’s worth repeating introductions to tools more than once, allowing students to take the lead with explanations after the first time. Being systematic and introducing only one tool at a time also helps here. Ultimately, we shouldn’t force our students to use technology if they don’t really want to. It doesn’t suit everyone. However, if we at least show them what’s out there and give them the chance to experiment with it, students can make their own decisions about whether or not to use the tools. I hope that these suggestions prove useful to you. If you have other solutions, please do add them to the comments. I would also be interested to hear about the tools which your students find most useful. Finally, if you any questions please post them in the comments. IATEFL and International House for the scholarship. My students for putting up with me and my endless requests during the research! My Twitter colleagues for sharing the survey and supporting me in my research, as well as introducing me to the tools mentioned in this presentation and many ideas for using them. Ceri Jones for helping me out with my scholarship application. Jane Harding da Rosa for helping me to conduct the research. Jenny Pugsley for giving me feedback on the final presentation. 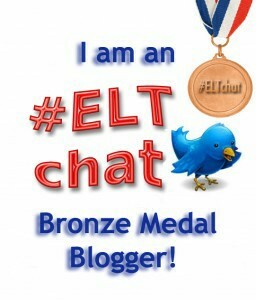 Update: I have written a step-by-step guide introducing students to Quizlet and podcasts (including for IELTS) on my Independent English blog. The twitter commentary and buzz was great. It sounds like it was a fab session. Thank you so much for posting all this online! I certainly wanted to attend! Let me second the congratulations! Will get back to you after I go through it properly. Thanks Naomi! I wanted to make sure that what I researched and presented was just as accessible and available for the people who weren’t in the room. It’s also good notes for me later, as I can go back and do the presentation again whenever I need to wihtout having to find the notes! 😉 Looking forward to hearing what you think about it. Congrats, Sandi. Great presentation. I really thank you for giving as the chance to ” attend” online. I have been your fan for a while and encouraged my colleagues here in Buenos Aires to follow your blogs and recommendations. Really inspiring. What a rigorous post! Must have been a great IATEFL session (sorry I missed it). Thought that teachers on the TeachingEnglish facebook page would find it really helpful so I’ve just posted a link it there if you’d like to check for comments. Happy to help! I’d be interested to hear how you decide to incorporate some of these tools in your Diploma. At http://www.learnclick.com you can create online gap-filling exercises very quick and easily. You can choose which mode you want (blank fields, dropdowns or drag & drop). If you’re not worried about tracking students progress then you can share your quiz with everyone (no login required). Thanks for the tip – it looks like a really useful site. Hi Sandy I was reading ‘Richard Smith, Deborah Bullock, Paula Rebolledo and Andrea Robles López – ‘By teachers for teachers’: innovative, teacher-friendly publishing of practitioner research’ in ELTED and was surprised to see ‘mybrainshark’ listed as a format, as I heard it was now extinct, but realised it was in reference to your work from 2012. I just wondered if you had found a replacement for ‘mybrainshark’. I hear Prezi has a narration function, which I’ve yet to use. I think that you’re able to narrate PowerPoints now, but I’m still using the Mac 2008 version, so I’m very behind the times. I haven’t found anything else yet, but tend to write out presentations now instead of narrating them. I wonder if anyone else can suggest anything. Also, thanks for letting me know I was mentioned in there – I didn’t know about that!